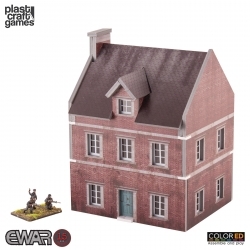 EWAR 15mm ColorED There are 6 products. 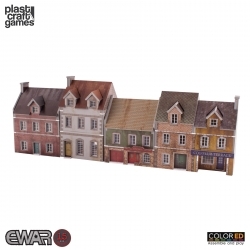 This pack includes 4 ColorED edition scenery buildings. All the buildings are inspired in Northwestern Europe architecture. These kinds of buildings could be found in different villages or cities in Northwestern Europe. It can be used as scenery for 15-20mm WWII miniature war games. ColorED edition scenery set. The Saint-Mère-Église is inspired in the real church located in the Manche department in Normandy. 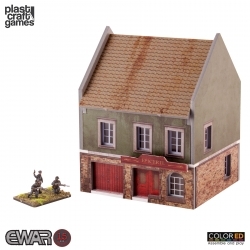 It can be used as a scenery element for 15-20mm WWII miniature war games. ColorED edition scenery set. The Small Shop is inspired in Northwestern Europe architecture. This kind of building could be found in different villages or cities in Northwestern Europe. 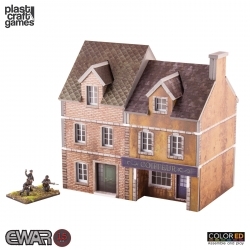 It can be used as scenery for 15-20mm WWII miniature war games. ColorED edition scenery set. The Coiffure Terrace is inspired in Northwestern Europe architecture. This kind of building could be found in different villages or cities in Northwestern Europe. 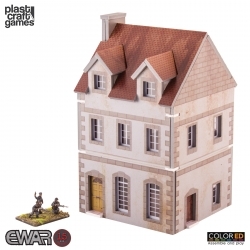 It can be used as scenery for 15-20mm WWII miniature war games. ColorED edition scenery set. The European Building is inspired in Northwestern Europe architecture. This kind of building can be found in different villages or cities in Northwestern Europe. 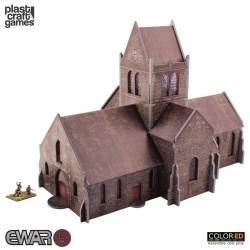 It can be used as scenery for 15-20mm WWII miniature war games. ColorED edition scenery set. The European House is inspired in Northwestern Europe architecture. This kind of building can be found in different villages or cities in Northwestern Europe. It can be used as scenery for 15-20mm WWII miniature war games.